I was looking for something else on my iPhone earlier today and came across this photo (from almost 2 summers ago). Apparently, I have never blogged it and it is kind of awesome because it is Phineas & Ferb, so sharing today! 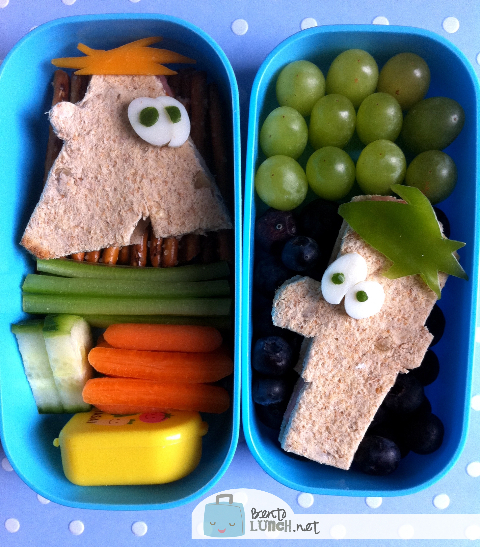 We have two Phineas and Ferb sandwiches, cut from multigrain bread, although I have no recollection what they are made of. They aren't as hard to cut out as you'd think, just cut one slice of bread first, then use that piece as a template for the second. I recommend not filling the sandwiches until after you make finish the cutouts. Phineas is quite easy to cut, mostly a triangle with a flat corner on the neck, then a small half circle at the ear, and another small cutout for the mouth. His eyes are boiled egg whites, cut with a mini-oval fondant cutter and merged together, then the pupils are dots of cucumber peel. His hair is cheese, freehanded to make the spikes. Ferb is a little harder, not quite a rectangle, but close. His ears involves a small bump out on the one straight cut, the top of his head/neck are flat, then he has a much larger nose about halfway down that opposite side, along with a tiny lip area. His eyes are done the same as Phineas' eyes, but his hair is a small piece of green pepper, also freehanded. Love it!! Hoping you have a FANTASTIC summer!